I am the author of four novels and one collection of short fiction. Two of the novels, The Manuscript and Pandora's Sisters, are published by Macmillan. Both are available in print and digital worldwide. The story collection is available in a wide variety of e-book formats, particularly Kindle. The new novels, D-Boys and Counter-Assault, the first two in a series of high-tech, political, special operations actioners, are forthcoming. A third is in production. I'm also working on a collaborative project with dark thriller writer Glynn James. My work deals predominantly with the central (and prodigiously enduring) problems of philosophy and religion. These include the stark anomaly of human consciousness, the paradox of free will in a mechanistic universe, and the possibility of morality in a world with, palpably, no inherent moral shape to it. Ultimately, I believe the human problem is unary: that of being an exquisitely sensitive spark of awareness irretrievably trapped in a dying hunk of meat and whirling through an empty and Godless cosmos. I tell fables about people trying to make sense of that. (The fabulous part is that, sometimes, they succeed.) They are helped along, and occasionally head-faked, by the findings of very new and culturally disruptive sciences and technologies such as evolutionary psychology, cognitive neuroscience, genetics/genomics, artificial intelligence, and this wacky Internet thingy. I believe that the insights of these vernal disciplines into our eternal mysteries may be profound. Perhaps seemingly incongruously, my work also tends to feature rather a lot of slam-bang action  two-fisted gunplay, leaps from burning buildings, demonstrably unstoppable hitmen, complex polygonal Mexican standoffs, white-knuckle computer hacking  all intended to give the reader a ride like Neal Stephenson just strapped him to a rocket, and then John Woo blew it up with a second, bigger, rocket. I believe in the revelatory power of human extremity. 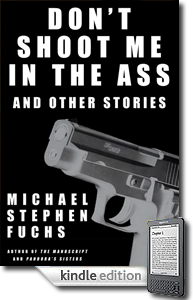 All works copyright Michael Stephen Fuchs 1994 - 2012, all rights reserved. No distribution or republication allowed. Contact the author for all use.